A 26-year-old man on holiday in Co Donegal died after being struck by a car in the early hours of yesterday. The man, named locally as Sean Heraghty, died in the incident at Sandhill on the outskirts of the popular seaside village of Dunfanaghy at about 4.15am. The car was being driven by a local man who had just collected two other people after they attended a nightclub in the village earlier. Neither the driver nor his passengers were hurt in the collision. Gardaí and ambulances rushed to the scene, but Mr Heraghty, who lives in Scotland, was pronounced dead at the roadside. The road was cordoned off and Garda forensic officers began a pain-staking investigation of the scene. 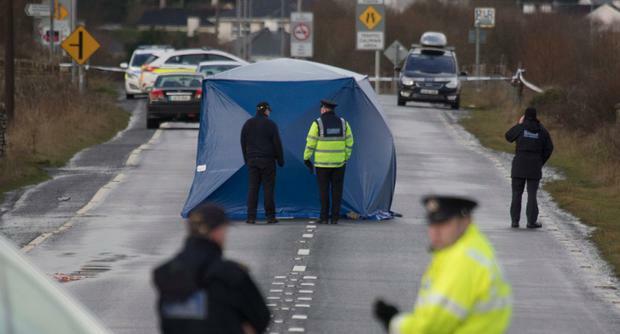 Gardaí erected a tent at the scene in order to carry out an on-site examination of the victim. It is understood that the young man, who lived and worked in Glasgow as a quantity surveyor, was in Donegal to spend the festive period with relatives. He was walking back to his accommodation when the accident happened. His mother Margaret was also visiting the area with her son for Christmas. The family have strong connections with nearby Falcarragh, in west Donegal, and were regular visitors to the area. Mr Heraghty was one of two sons in the family. It is believed he had been staying in a holiday home on the outskirts of Dunfanaghy village. Parish priest in Dunfanaghy Fr Martin Doohan said the tragedy was "every parent's nightmare". "Christmas is a time you associate with families and being together," he said. Fr Doohan said prayers were said for the young man at Mass yesterday morning. He said there was a sense of terrible sadness in the town. Fianna Fáil councillor Seamus O'Domhnaill, who is based in Falcarragh, said it was "utterly devastating" to be waking up over the Christmas period to the tragic news. He said the fact that somebody has lost their life tragically over the festive period weighed heavily on people's hearts. "The community is dumbstruck by the events that unfolded yesterday morning," he said. The hearts of the local people go out to those affected by the tragedy, he said. It is understood that Mr Heraghty's family have requested that he will be waked for at least one night in Co Donegal.